SmartsysSoft Greeting Card Designer helps you easily design cool greeting cards for birthdays, Christmas, New Year, Thanksgiving, Valentine's Day, anniversaries, or any occasion. 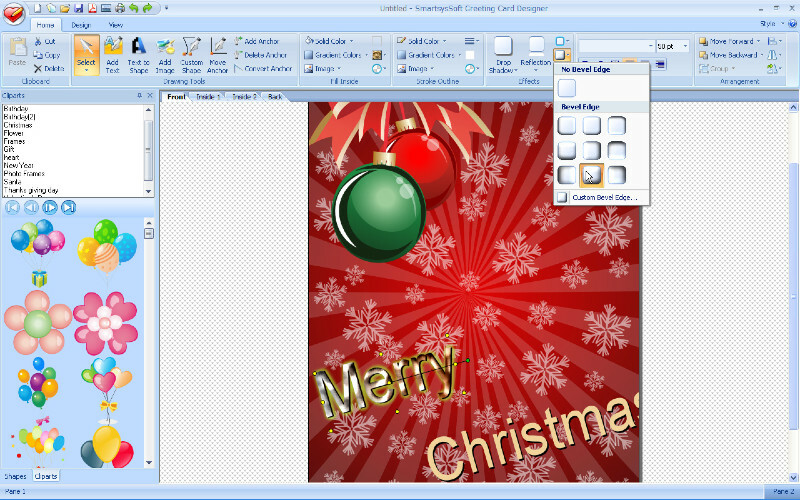 It provides hundreds of greeting card templates and a lot of pre-designed symbols, clipart and pictures. So that, you can create an attractive greeting card with easy as following: firstly select a template from templates library to start your design; then add or replace with your own photos or clip art,; finally do some modification for some texts as you requirement. SmartsysSoft Greeting Card Designer is also a great vector graphics program. Some drawing elements such as texts, clip art, shapes, symbols, images can be added to your design as you needs. Each one is painted very smoothly. So that, you can get good-looking greeting cards with very high quality when designs are translated to printing. All vector objects can be filled or stroked with solid color, gradient colors, images or patterns. More than hundreds of dash styles are supported to be used for stroking shapes. Besides that, SmartsysSoft Greeting Card Designer provides very powerful shapes tools to edit path of vector objects. With which, you can create the most unique shapes, symbols or texts if you desires. SmartsysSoft Greeting Card Designer is also professional quality printing software. It supports to print your cards on any Windows compatible printers directly. Also it is allowed to save your design as a high quality image with PDF, BMP, JPEG, GIF, PNG, TIFF format for outside quality printing.